Most girls have definite ideas on how they want their room to look and the majority, though not all, will want the final effect to be pretty and feminine, probably with pastel colours and lots of attractive details. Curtains can bring an element of colour and pattern into a room; however, very bright or heavy designs may dominate it. Pretty lined or unlined voile curtains always look good, as do simple gingham blinds with a frill around the edges. Young girls have masses of toys which, as they grow older, turn into piles of clothes. So when you are planning furniture, be sure to buy a large enough wardrobe. You can paint it in a soft colour to match the room, then stencil on bunches of flowers. Alternatively, instead of a wardrobe, you can hang a rail with a curtain across a corner of the room. For younger girls, leave a corner of the room clear so that they can create a ‘home’ area where they can have tea parties with dolls, play games with friends, or make a toy shop. For older girls, if the room is large enough, find an old sofa which you can cover with a throw-over. It will be a great place for your child to curl up and read her books. A towel with her name sewn on it, a hairbrush with a hand-painted back or a colourful fabric coat-hanger will all be treasured, and a pretty bedspread, which you can either buy or make yourself, may even encour­age her to make her bed. Quantity of pink gingham ribbon 5cm (2 in) wide. The amount you need will depend on both the size of the bed­spread and the squares. As a guide, for a 1.8×2.4 metres (6×8 ft) bedspread you will need 21 metres (21 yards) of ribbon if you are going to sew 60 cm (2 ft) squares, and 37 metres (37 yards) if you decide on 30 cm (1 ft) squares. Knowing the dimensions of the material, first work out on paper what size your squares of ribbon are going to be. You should take into account the fact that the smaller the squares, the more ribbon you will need, and also that you will be using a border of ribbon all round the bedspread edges. Lay the calico material flat on the floor, and with the help of a tape measure transfer the grid system you have worked out on paper onto the material, drawing the lines faintly with a soft pencil. Cut as many strips of ribbon as you need to go on the bed­spread lengthwise, and pin them to the calico along the marked-out lines. 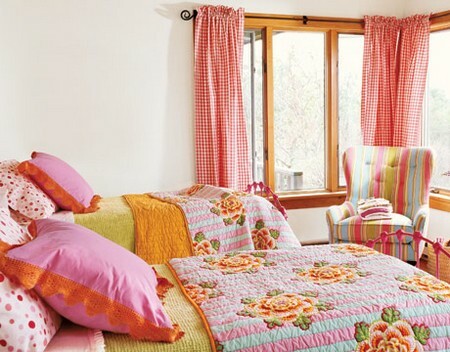 Cut as many strips of ribbon as you need to go across the width of the bedspread. Weave these alternately over and under the long strips, as if you were darning, and pin them to the calico. When the pattern of squares is complete, sew the ribbon to the calico by machine. Machine on the border at the same time as sewing on the lining. The calico should overlap the lining by 2.5 cm (1 in) all round.